Recently for the prevention and treatment of many neurologic, metabolic and other chronic diseases, the focus has shifted from allopathic Western medicine to alternative and complementary medicine in many countries including the United States of America. In fact, some dietary supplements including herbs, vegetables, nuts and fruits have demonstrated promising outcomes in improving human health. Among them, pomegranate is one of the exotic fruits that has been known for its valuable effects. Pomegranate (Punica granatum), one of the oldest known fruits belongs to the family Lythraceae. It is believed to have originated in Persia and have several varieties. At present, pomegranates are grown in many Middle Eastern, Asian, European and other Western countries, including the United States of America. Pomegranates have been used for thousands of years in treating a wide variety of diseases in ancient times and currently used to treat many complications, including; pregnancy, coronary heart disease, atherosclerosis, prostate cancer and male infertility. The beneficial effects of pomegranate have been revealed in the writings of many cultures and religions, since they were grown in abundance in all ancient civilizations. Pomegranates have been appreciated for their beautiful color and flavor, and health beneﬁts since ancient times. The edible juicy ruby red arils are full of antioxidants and are considered the healthiest part of the fruit. Fortunately, the century-old description of the pomegranate as a healthy fruit among all others still holds its integrity due to the presence of antioxidants, vitamins B6 and C, minerals, andﬁber. 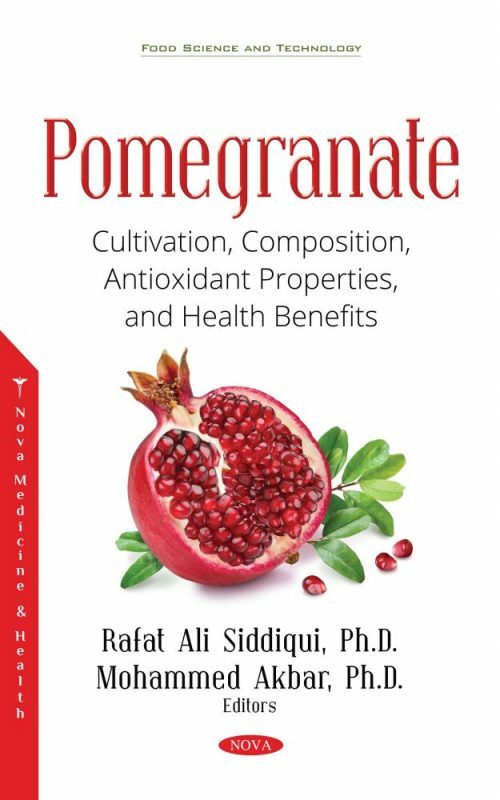 Accumulated evidence suggests that naturally occurring phytocompounds, such as polyphenolic antioxidants found in pomegranate may potentially hinder neurodegeneration and improve memory, cognition and other brain functions. The effects of pomegranate as a medicine in neurological and other diseases are discussed in this book. This book will benefit students at various levels of academia, scientists in several disciplines (such as alternative medicine, nutrition, neuroscience, agriculture, food science, and medicine) and many others interested in this discipline. This book may become a part of the curriculum at various universities globally. Chapter 7. What Can We Learn about the Traits of Aril Juice by Studying Wide Collections of Diverse Pomegranate Fruits?